Welcome to Season 2 of Contracts for the New Core, a monthly series focusing on young Reds players that the club should sign, and some comparable contracts for similar players throughout history. Last year I wrote about potential contracts for Jesse Winker, Tyler Mahle and Anthony DeSclafani, among others. 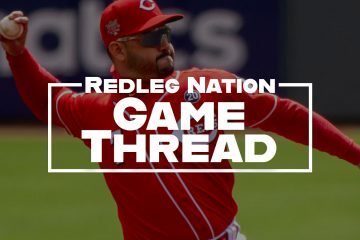 This year we have even more Reds players for whom an extension might make sense – including a rather controversial potential extension that is not only timely, but perhaps the smartest move the Reds could make at this point in the season. 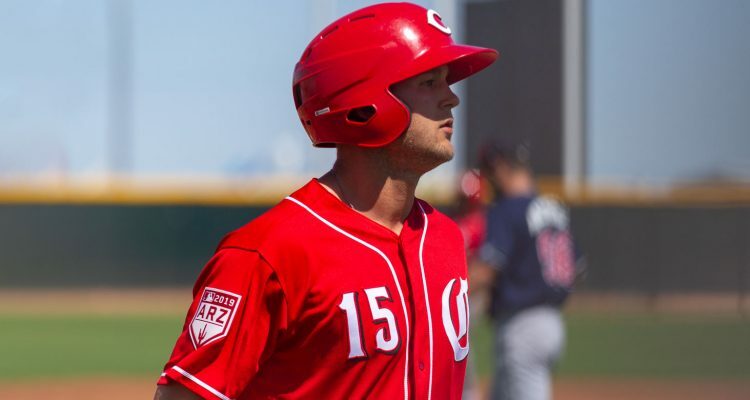 The Reds should sign Nick Senzel to a long-term extension. I’ll be frank – the idea of this particular entry into the series was workshopped before the news this past weekend’s news that the Front Office would be optioning Senzel to AAA Louisville. The idea of the extension was to once and for all put an end to the question of where Nick would start the season for good by giving him not only a Major League contract, but one that is equivalent to his skill. The decision to start Senzel in AAA for the year throws a wrench in this plan. If you follow me on Twitter, you’ll know that I don’t agree with the move in the slightest. Playing service time games with perhaps the most important player to move through your system since Jay Bruce is definitely a risky strategy–risky enough that I consider it a poor move. Yes, the Reds will likely gain an extra year of control for Nick Senzel at the end of his rookie contract. But what do you give up in exchange for that? For one thing, it’s not even a given that the current loophole will be around when Senzel’s rookie contract expires. In fact, with the way the loophole has been obviously utilized by teams like the Blue Jays and the Cubs, the Player’s Association will surely place an increased effort to end this side-stepping of the rules once and for all. Let’s throw this out the window though, and assume Nick Senzel plays baseball for the league minimum salary for the Reds for the maximum amount of time, and then enters arbitration. And yes, Reds fans, Senzel will now definitely be entering arbitration for three solid years. Take a look at Kris Bryant’s situation – very similar to Senzel, Bryant was a unanimous top 10 prospect, absolutely ready to make an impact on the Cubs roster as a rookie. The Cubs, very similar to the Reds, made up some bad excuse to keep Bryant down in AAA for the minimum amount of time to get an extra year of service time on his contract. As guys like Eugenio Suarez, Aaron Nola, and Alex Bregman signing team-friendly extensions, Kris Bryant has fought tooth and nail with the Cubs every single year through arbitration, aiming to get the maximum amount of money possible through the process. He has refused to sign any kind of meaningful extension with the team, and has made his disappointment with service time manipulation very clear. I can definitely see how, if we were playing a video game, or if the players were robots, this would be considered a savvy business move. But these players are real, and have real emotions. Just check out Nick Senzel’s agent’s response to the news. Let’s get one thing clear – that’s most likely Nick Senzel talking through his agent. Instead of working with Senzel and fostering a positive relationship with the club, the Reds have lied and cheated Senzel out of a roster spot on the big league club. I’d be shocked if Senzel didn’t take the same actions that Kris Bryant has and will take with the Cubs – no extensions, fighting tooth and nail through arbitration, and eventually leaping into Free Agency, where he will give some other team his peak seasons. So, how do we solve this situation? If we “lose” a year of Nick Senzel by starting him on the Opening Day roster, but we ruin the relationship with him by playing service time games by sending him to AAA, which is the best option? The answer, of course, is Option C: Sign him to an extension now. Signing a Prospect to an Extension? Impossible! Long contract extensions for prospects with little to no big league experience is rare, but not unheard of. In fact, I touched on most of them in my plea for the Reds to sign Jesse Winker to a long-term extension last season. Contracts like Evan Longoria’s were clear home runs for the team, and the White Sox locked up top prospect Eloy Jimenez to a six year, $43M contract extension on the same day Nick Senzel was sent to minor league camp. Of course, detractors will mention Brandon Larson, and if they’re a little more topical, Scott Kingery. I referenced Kingery’s 6-year, $24M contract extension in the Winker piece linked above, and used it as part of a model to create a potential Winker contract. Kingery far from lived up to the extension in his first season with the Phillies, floundering with a 62 wRC+ in 484 plate appearances. And yes, there’s always going to be that risk that a prospect flames out. 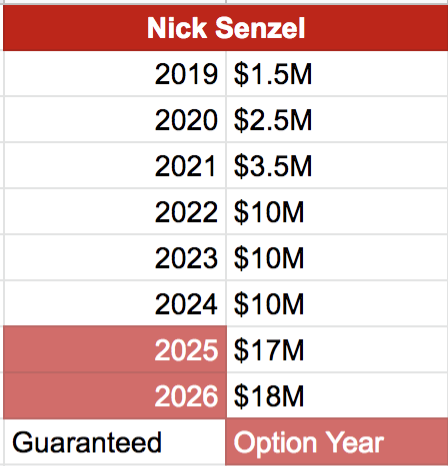 But tell me this – if you’re so worried about Nick Senzel failing at the big league level, why place so much emphasis on clawing out an extra year out of his contract in the first place? As you can see, only one year of the guaranteed money grants Jimenez more than $10M. That’s pretty cheap for a guy who profiles to be pretty dang good. Jimenez is currently MLB Pipeline’s #3 overall prospect. Nick Senzel is #6 on that same list. The difference between their projected outputs is minimal – the difference is the relationships the two players share with their teams. I think if you’re the Reds, you love that contract for potentially your fourth best hitter. However, at this point, it’s more likely than not that the relationship between the Reds and Senzel is so fractured that there’s no way he’d sign it. So what solves problems like this? More money. The Reds can salvage their relationship with Senzel, but it will cost them. I’ll be honest – the likelihood that this contract comes to pass is slim to none. I firmly believe that now Nick Senzel will be a Red for as little time as he is contractually obligated to be. He’ll test Free Agency as quickly as he possibly can, and will refer back to these service time games at least once between now and then. Because of this, he’ll never reach his full potential in a Reds uniform, as he could have if the team had just been faithful to him and given him his due. Unfortunately, this is where we’re at, and this is our team. It doesn’t feel great rooting for them right now, to be completely honest. But I’ll be looking forward to the day Nick Senzel finally steps onto the field as a Cincinnati Red, and will root hard for him while he’s a member of our team. Once Senzel becomes a free agent he will be 30 years old if I did the math right. So if he wants to leave, let him. I wouldn’t want to sign him to a massive free agent contract most likely anyhow. It’s unfair but the way things are set up right now teams get the best years for cheap. 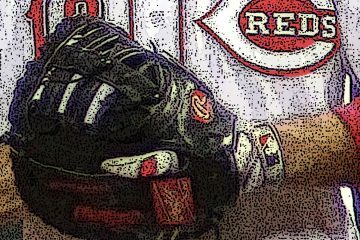 Reds control Senzel thru 2025 (assuming he stays down 2 weeks) so what would be the point from Reds’ standpoint with only buying out one free agent year? You get cost certainty I suppose. But under this scenario, you’re paying $53M for 4 arb years – and keep in mind you’re overpaying the first 3 min salary years. Unless you think Senzel will perform like Betts (highly unlikely), I’d go year to year instead of this contract. Buy out another free agent year with an option, and reduce the arb year guarantees slightly, it would look better. I’m not as disappointed with the Reds handling of Senzel as you are Jordan, but it’s close. If there’s a way to extend him into a couple of years of free agency then I’m all in. And I think it’s important to look at net cost here too. If the Jimenez deal is $70M covering those 8 years, or if you prefer, $35M through his arbitration years, what are those numbers relative to? If he plays well then the first six years probably cost at least $25M and maybe more, and the next 2 are probably well more than $25M. The marginal cost is low and the upside is huge. If he’s a bust, or if he’s consistently hurt it’s a bad deal for the Reds. But if he’s good it’s a good deal, and if he’s great it’s a steal. I agree that Senzel may be very reluctant to consider this kind of deal. But what better way to make it clear that he’s wanted than to give him life long security and compensate him generously relative to other prospects? And while we’re doing that, how about bringing him up in two weeks (or better yet now) to play second base for the Reds, at least until Scooter is healthy? IMO, as the last paragraph shows best, this piece is far more about emotion and virtue signalling than presenting a sound business case for either a) not sending Senzel down to gain the extra year of control and b) offering an extension now. Opinions are fine, we all have them. However, I certainly hope the Reds don’t use emotion and use facts and cold, hard reality in making the best decision on employing Senzel. -Senzel has no other realistic place to play in the U.S. or Canada until, it appears, 2026…his age 31 season. Using those facts, sending him down for the extra year of control makes complete business sense. Leverage exists in baseball and most forms of employment. The MLB owners/teams certainly have it….the union needs to negotiate some of it back. Extension? IMO, it would also make sense to let him play for a season or two and confirm his health, and establish his MLB floor/ceiling. However, perhaps the Reds have internal data they believe in to offer him something now, even without a MLB at-bat to his name. If so, great. Either way, using a rookie player’s feelings in 2019 as a basis for such an important team decision on his long-term future as an employee feels unwise to me. I agree wth your opinion in this case, but I have a question about terminology. When did it become wrong to signal virtue? Isn’t every opinion, including yours, an example of signaling virtue? Seems like throwing out the term “virtue signaling” is nothing more than an in-group buzzword for an opinion on the other side one doesn’t like. Some needless hand wringing going on in this article about the hypothetical feelings that Senzel is supposedly experiencing for not making the 25 man. We don’t know what his mindset is and we certainly don’t know that the relationship between the Reds and Senzel is fractured beyond repair. You should be probably be thanking Schebler for giving the Reds a legitimate reason for keeping Senzel down and thus ensuring one more year of control, instead of calling them greedy for playing by the rules. Sorry this wasn’t mean to be a reply to Steve. Well put on the whole “virtue signaling” thing, Steve. So Senzel is sent down due to the team’s need for an additional year of control. He’ll be back up in two weeks. In the meantime, if the Reds management is smart, and they are, they don’t want him to risk injury in a AAA game. They need to just shelve him for a while. This makes his twisted ankle very convenient. Emotions are a reality (even in a business like baseball where they are often shamed). The Reds should absolutely weigh Senzel’s thoughts and emotions regarding his contract and arbitration when deciding where he plays this year. It would be foolhardy not to. You don’t just cater to your most talented players when they are under contract. Joey Votto is incredibly important to the Reds past, present, and future, and the Reds treat him as such. Senzel is incredibly important to the Reds present and future. I want a player with his talent to be motivated and content throughout his time with the Reds, and that should be the priority. Obviously, none of here are close enough to the situation to know for sure the best path to follow (unless there is a Colangelo among us). But completely disregarding the human, social, and moral elements to this (which I don’t think the Reds are doing, but it’s the way many of these arguments are presented) it isn’t just cold – it’s negligent and bad business. Since Jordan is sharing his opinion (and the reasons behind it) about a baseball situation on a site dedicated to baseball news, analysis, and opinion, I believe you’re using that term incorrectly Sliotar. I had to look”virtue signaling” up as it is a new one to me, but it seems to be something entirely different. Whether you used it correctly or not, it seems like a condescending, pejorative, and generally substance-less term. In this particular case, since the content of your comment is in exactly the same vein Jordan’s article was (your opinion and reasoning on Senzel’s situation), it’s not a real flattering look for you any way you slice it. Totally against locking him up a few extra years now. Let’s see if he can have 2 above average, vertigo-free years in a row, then you can offer up some kind of extension. So it might cost you a few extra bucks more if you wait. That’s better than him crashing/burning and being stuck with a salary albatross for the next 6 years. Probably the prudent thing to do. of course it will cost you a whole lot more. RIght now, the motivation and emotional internalization for the Reds organization and Nick Senzel are unknown, despite our efforts to fit those details into our personal predisposition. The fact remains that Senzel would have been playing at the MLB level last season, except he got hurt…twice…and played only 44 games at AAA in 2018. Unless the Reds plan on delaying Senzel’s service time to avoid super 2 status, he will have 4 years of arbitration, not 3 years of arbitration. This is where the egregious service time manipulation occurs, because that is ALL about saving money rather than extending control. Alex Bregman: 2.070 yrs svc tm (svc tm manipulation) signed extension 03/19/19. Brandon Lowe: 0.058 yrs svc tm (svc tm manipulation) signed extension 03/19/19. Nolan Arrenado: 5.155 yrs svc tm (svc tm manipulation) signed extension 02/26/19. I do believe that extensions for Winker and Senzel are justified, important and viable. Well put, Cossack. I meant to mention the part about how Senzel SHOULD already have almost a year of service time already at this point – the Reds signaled he was ready at this point last year. It’s very hard to deny the greed level here. Was Homer Bailey greedy when he didn’t retire last summer after he indicated he could not pitch from the bullpen when the Red’s manager stated that’s how they wanted to use him as he was horrendous as a starter? Bailey produced a net negative WAR for the Red’s $105M investment in him. Not sure how Homer relates to this situation, but no, I don’t think Homer’s decision not to pitch had anything to do with greed. Teams have almost an infinite amount more leverage than a player does, as is clearly shown in the whole service time fiasco. I honestly don’t know what I would have done in the team’s position OR in Homer’s position, which is why I didn’t write an article about it. Greed seems like a pretty harsh word that really gets to motive. It implies the ownership is really trying to take advantage of a player. I agree that Bailey was simply leveraging his contract–it was after all guaranteed in accordance with the CBA and the Reds understood the risks when they signed it. Likewise, I don’t think you are making your case that greed is the Red’s driving factor. Worst case, they are leveraging the same CBA that yielded Bailey’s 6-year, $105M contract. Both cases are simply examples of each side getting the most utility from the CBA–basic rational choice theory. The fact is, Senzel was hurt for most of last year–not ownership’s fault. Also, he has only played CF in a spring training and has logged only 37 games at 2B since high school. It’s quite possible Senzel was sent down for baseball reasons–his and/or the team’s best interest. Since we don’t know how long he’ll spend in the minors, it’s premature to assume it will be the first day that prevents him from getting a full year of service time. That is so wrong Jordan. How was Senzel going to play in Cincinnati last year with Gennett and Suarez blocking him. There was no place to play him and to think he was on the verge is wrong. I also feel that those who feel he would have been called up in July/August if not for the injury are wrong. You don’t call up your best prospect to sit on the bench. I like Senzel but he is still unproven. He doesn’t send Gennett or Suarez to the pine and until he get everyday AB he should be in the minors. @Stock – Ben Zobrist has made a career (and 3 All-Star games) out of not having a set position. Just because you can’t say “Nick Senzel will be our every day second baseman”, doesn’t mean Nick Senzel can’t have just as many ABs as Scooter or Geno would have last year. 1. the Reds had three former 1st round draft picks trying to make the team this spring: Phillip Ervin, Nick Senzel, and Connor Joe. None of them made the final 25 man roster. 2. if this team had decided to start the year off with 5 OF’s then the fifth guy should have been “Mr. Magic” Ervin. PE has MLB experience and outplayed Nick in every way imaginable the entire spring. In hindsight, I wish that the team had held on to Connor Joe a few more days with the untimely Scooter injury. Connor has a lot more experience with playing around the infield than Nick does, couldn’t be optioned, and we lost him for good…..but nobody had a crystal ball and could see Gennett’s groin injury coming. b) if Scooter had gotten hurt two days earlier then Joe would have been the clear choice as the extra utilityman/infielder. Instead we had to go with recalling Farmer, who also fits the bill as far as having more utility/infield experience. Your little conspiracy theory/service time mumbo jumbo simply doesn’t make any sense. Your boy Nick is getting closer, but he would have been the 27th/28th man on this year’s Reds opening day roster. Mumbo Jumbo? Have you read his agent’s statements? Have you read the (linked) Kris Bryant unhappiness? If Nick Senzel hadn’t been demoted, he would have started the season playing every day in CF, as he will when he’s called up in Mid-April. Anything outside of that reality, and I’ll be shocked. If and this is a big IF in this situation, Scooter never got hurt, then the Reds would have had a very legitimate reason to send Senzel down. Schebler has already proven to be, at the very least, a slightly above average major league player. He is also in his prime and some believe due for a breakout year. Additionally, he outperformed Senzel in a head to head competition this spring. As long as Schebler doesn’t begin the year in a slump, I see no reason for the Reds to call up Senzel and hand him the starting CF job after his 2 week stint in Louisville. Spring Training stats don’t matter. Nick Senzel had a lower OBP than AVG. That won’t be the case for his career – maybe he was working on hitting for more contact in games that don’t matter? Maybe the coaches asked him to swing more than he normally does. Maybe the coaches asked Schebler to take more walks. Maybe the pitchers they both faced were working on different things. So many variables in Spring means that Spring production (at least, Spring stats) can’t be used to make roster decisions. The coaches saw these players everyday and choose Schebler. He won the competition, it’s as simple as that. And about this whole “spring training stats dont matter”. That has become quite the talking point around here. I’m very confident how the players perform in the spring games is definitely part of the coaches evaluation of them, it’s just not the be all end all of the evaluation. It’s even more true when evaluating young players against MLB competition for the first time. Connor is gone (San Francisco sounds absolutely thrilled to have him), Ervin was tearing it up and still got sent down, and BobSteve is yet another 1st round pick who is still on the roster bubble. Now, we as fans all have our favorite players (and prospects) who we root on for various reasons. I really hope Senzel’s agent was not speaking as his mouthpiece and feel like if he did go off on his own little tangent that Nick should fire him immediately. If not then this kid needs a serious attitude adjustment. I’ve edited this post. Shamrock, you were warned the other day about insulting players, among other things. Your commenting rights are being disabled. We simply aren’t going to have the name-calling and insulting over and over here. If Schebler is hitting .280/.360/.475 on May 1 would you still call up Senzel and bench Schebler? I know if I was Bell I wouldn’t. I took this ST to be a position battle between Schebler and Senzel. Schebler won. The Reds are not playing a control game here. They are bringing their best team to Cincinnati. I have been on board with sending Senzel down all spring, not because we gain a year of control but because I think Schebler is his equal or superior vs. RHSP. Look at the schedule and I think you will notice that the first 3 series contain a lot of RHSP. Wasn’t it Kris Bryant that mentioned several times this spring that he was very open to an extension? He does not seem too disgruntled to me. @Stock I’m sure Bryant is open to an extension now, with the way Free Agency is going. Doesn’t mean he’s happy about how he was treated. Reference Blake Snell. He was worked up about contract raise, made national media, then signed a long term deal. Same for Eloy. He signed assuming the Sox would get an extra year. The emotional impact is vastly overstated. In some cases, sure. In other cases, the emotional impact is very real. It’s not a 1:1 comparison, but look at how far apart Bryce Harper and the Nationals were this offseason. That relationship was so ruined, a chance to reunite seemed impossible most of the time. The idea that Senzel is now firmly against ever signing an extension with the Reds is ludicrous. Even if we wait 3-4 years from now, the same advantages are still present. Guaranteed money and insurance against injury. Same reasons why he still might sign something like that now, especially considering the issues he’s had in the last 18 months. Even this worst case scenario we still control him through his age 30 season and pay for none of his decline. Sure we’d like to have him through ages 32-33 if he’s everything we hope, but better to let go a little early than way too late. It’s not ludicrous if there’s historical precedence. And yes, I agree, waiting 3-4 years from now would give you the exact same advantages, which is even more reason to sign him to a cheap extension now. Think about the good relationship there – if he’s an absolute stud and the Reds have been taking care of him the entire way, he’s much more likely to sign an Eugenio Suarez type of extension to take him ALL the way through his prime. Disagree with this too. The Nationals offered 10 years and $300 million. The fact that the Phillies overpaid is not a signal that they had a bad relationship but rather the Nationals felt they had a well qualified replacement in Robles. The nationals were one of the final 2/3 teams in the bidding for Harper. So to say there was bad blood because he didn’t sign with them makes no sense to me. Agree 100% Duke. Why sign him now with so many uncertainties. And to sign him for more than the Jimenez contract as proposed above makes even less sense. He has vertigo. How will that play out. Not so well for the Reds in the past. Maybe he is fine but there is a risk there. Risk has a price. It is being totally ignored here. If he wants to sign a Kingery contract I am all in. Suddenly the Risk/Reward is more palatable. The problem here is that Senzel is unique. To compare him to Jimenez makes no sense because of the injury history. To compare him to Kingery makes no sense because he is a better prospect. Best to let him gain a couple of years experience and then the Reds can better determine his true value. Right now I am sure the Reds have talked with Senzel’s agents but are far apart in their valuation of his risk’s. I appreciate your perspective on this and would not begrudge Nick for doing what is best for him. However, I think you are taking the stance that this is what Nick will do and not sure where you are drawing that knowledge from. When he spoke yesterday he said all the right things about Schebler, while his new agent did his job and spoke more from the perspective of this article’s opinion. This is the business side of baseball; the agent, the player and the club either will or won’t work something out that is in everyone’s best interest. I also don’t think Nick has earned his way onto the team as it is currently constructed. You have 4 major league OF’s ahead of him. He has less than 200 at bats at AAA and has played very little baseball the past 8 months. The Reds are doing him a service by making him a CF, who will earn more $ than as a 2nd basemen. I want him to be the next Trout or Bryant, but that is the Fan in me not the reality of the situation today. If I am the Reds, I take the pressure off Nick, send him to AAA to start the season, get the AB’s and CF experience call him up in late April/May and work him into the lineup. The Reds season does not depend on Nick Senzel being in the opening day line up. The Reds have a really good line up. The Reds season depends on the pitching. I really appreciate your enthusiastic support of Nick and think he will be a very good player, one that the Reds should consider giving the contract extension you lay out. I prefer a little less “the Reds screwed UP” and a “Nick is gone ASAP because he now feels slighted” opinion. If you spoke directly with him or his agent, then reference that in your article. Mention that the Reds paid less than slot value when they drafted him. But to go off what the New Agent said after he is demoted is a reach for forming the conclusion that Senzel and the Reds relationship is now broken and he is out of here as soon as he can be a free agent. A lot can and will happen in the next six years, which will probably include Nick Senzel making Million$$$ in arbitration because he is really good. And maybe the Reds and Senzel will reach a deal that makes him a Red for a very long time and he will make Million$$$ if it is in everyone’s best interest. The big difference in the actuality of the piece and what you’ve presented here is that I’ve never said this is fact. It’s an opinion based article, using a comparable case in Bryant to show what COULD happen with Nick Senzel. You’re right, he said exactly the right thing about Schebler. But in reality, what CAN he say? Again, venturing into opinion here, but I believe Nicks’ real words were said through his agent. Fair enough Jordan. I liked the article, just lost me in the final paragraph. I think your conclusion is a bit of a reach, but you could be right he will be out of here ASAP but the Reds will have control of Nick Senzel for the next 7 years into his age 30 season. With that being the case, I am not sure you really need to extend him. We all have a shelf life and Nick’s may not be any longer than most players as they get into their 30’s. Please keep up the good work, I do appreciate the articles you put forward. Doesn’t the fact that Bryant is hoping for an extension blow your last paragraph out of the water? I don’t think Bryant is upset at all. I think he is playing the game and appearing to be upset to improve his leverage. If there was zero chance of the Cubs extending him he would not be telling people he is open for an extension. Reality is there is not one situation where playing the game has ensured 7 years of service and then a flight to free agency. Hasn’t the front office tried to run this team with emotions in the past, extending Brandon Phillips again or keeping players like Jay Bruce or Zach Cozart or Billy Hamilton too long all because the owner “loved these guys and how they play the game”. I think we found out the hard way as Reds fans that you cannot run a team (read Business) with emotions. They have a legitimate reason(s) to send him to AAA. He was hurt twice last year and only played 44 games in AAA. He missed time the season before that with injuries/vertigo. He is learning a new position that he has not played since little league and has only been playing for all of 15 spring training games. Who honestly thinks that if Senzel does not have this service time issue that he would love this organization any more or less and would take a “hometown” discount when it comes to free agency. He is going to take the most money he can get, as is his right to do (and full disclosure, I hope he gets a lot as I love the type of player he could be). Let the kid prove he can play for two years and remain healthy first before throwing money at him. The best ability has always been availability and he just hasn’t been available enough the last 3 years for the club. Exactly! Emotional decisions have been a huge problem for years. Senzel, hopefully, will be a great player, but in a three way battle for the centerfield position this spring, he came in third. I second your Exactly ! There are emotional issues here because Senzel can definitely play in the majors at this point. But, he did get beat out in centerfield by Shebler. No two ways about it. I saw that “diving” catch the Senzel made when he moved into right center. That was pretty ugly, could easily have majorly hurt himself. Clearly he needs some more work to do. Everyone trots out the BP contract, but that was the perfect definition of a fair contract. He was underpaid at the beginning, overpaid at the end, and the team got almost exactly market value over the life of the deal. Furthermore, back then it was common industry practice to pay players, at least in part, for what they had done in the past. Don’t see much of that any more. There’s a HUGE difference between the front office emotions (nostalgia for certain players) vs the emotions of a potential franchise cornerstone (being pissed about being jerked around for no good reason). The FO ultimately makes the decisions 90% of the time, but you better believe the player will control what they can control, when they get an opportunity to control it. Well said. Don’t underestimate spite. Pitching prospects are WAY different than hitting prospects. The difference between pitching vs minor leaguers and major leaguers is huge compared to hitting vs minor leaguers and major leaguers. Also, Robert Stephenson never produced even close to the level that Senzel has produced. Senzel’s numbers aren’t relient on stats racked up against poor pitching – those stats are definitely there, but the intangibles and advanced statistics scream that this kid is going to be one of the best hitters on this team. Robert Stephenson always had promise, but never hit the point of being a “can’t miss” prospect. Everyone likes to quote the Agent but in Senzel’s words he felt Schebler earned the CF job by outplaying him in Spring Training. I did not get any animosity on his part, though I am sure he was disappointed as I am sure all the guys in the big league camp that didn’t make it were. Sounded like he was a little embarrassed by his agent’s comment and there is no guarantee the guy will still be his agent in 7 years.. Unlike in the Bryant case, who clearly won a Cubs starting job in Spring Training, Senzel did not. As far as a long term agreement I would use the same timeline as was used with Suarez. DB commented on calling Senzel into his office to advise him that he did not make the 25-man roster. DB specifically stated that Senzel was not happy, but that was to be expected as a normal reaction. DB also stated that Senzel handled the news professionally. Some have said the Reds shouldn’t worry about service time now because Senzel will eventually sign an extension and it will become moot. An exercise like this shows the importance of adding that extra year of control even in the case of an extension. I’d rather have the two years of extension be on top of seven instead of six. My interest is not that of what’s best for Nick Senzel or the Reds bottom line. It’s what makes the Reds a better team. Right now it feels like more years of Nick Senzel would make the Reds better. In 2015 a lot of us envisioned that more years of BobSteve as our Ace would make this a much better team moving forward too. We all hope that Senzel has a great career, but let’s not jump to silly conclusions before the kid even gets his feet wet in Cincinnati……. As I recall the discussion regarding Stephenson back in 2015, there was a division regarding the efficacy of keeping Stephenson for his potential as a future rotation anchor or trading him for MLB ready prospects. The evolution of those discussions centered around his slow development as the ace many people envisioned. Stephenson never made the transition from lower MiBL to upper MiBL successfully. That doesn’t correlate with Senzel’s situation at all. Senzel has dominated at every level of MiBL, including AA & AAA. Robert Stephenson is a good cautionary tale. I don’t have numbers on this, but I think hitting prospects “hit” more than pitchers do. 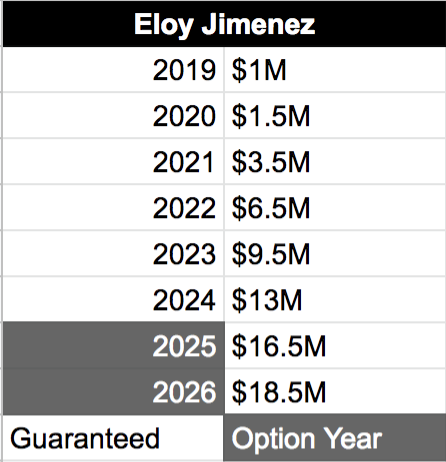 It’s important to keep in mind that extension contracts like the one signed by Eloy Jimenez and proposed here for Nick Senzel are largely covering pre-arbitration and arbitration years. For those years, the payments aren’t more than they would be without the contract, although they would be guaranteed. And the couple free agent years are at a big discount relative to what the player would earn waiting and hitting the free agent market (assuming they become a star). So while these contracts have big sounding numbers, they aren’t super risky for the club. If Nick Senzel is as good as it seems, I’m all for an extension that buys two of his free agency seasons. But I don’t think there’s any rush. The deal will be there in a year or so. Objectively speaking, Scott Schebler played better this spring than Nick Senzel did. Nick Senzel saw that. If he has the right to be mad about anything, it’s that the Reds haven’t been able to create a place for him to play, particularly at 2B. It’s really hard to imagine that Nick Senzel, who can see and judge the baseball talent in front of him, honestly feels like he got cheated relative to Schebler this spring. If you think my opinions on RLN signal virtue….you haven’t been reading them. I am sick of the lovable loser… “we have more bar taps this season in RF”… schtick this ownership is selling us, and want smarter, more ruthless decisions across the board. There is a players’ union, 24/7 media, and the players themselves have numerous ways to get their views out. I am hardly worried about them being mistreated or their feelings. In reality, I am in the Groucho Marx camp of not wanting to belong to any club that would have me as a member. This is really a good post. Ya all have made excellent points. From the emotional side of things to the pure stone-faced business side of things. The best thing that Senzel can do is simply go down to AAA and tear it up and simply make the Reds have to promote him. If I recall Schebler has never played a full season without injury. When that happens or if does not continue to perform then Senzel should be the man. And if Senzel performs Schebler will need to bide his time till his opportunity reappears. The Reds will extend him at the right time for all of the right reasons or he will decline and become a free agent at some time down the road whenever that is.None of us know what he has been told other then he is going down and play center field.If the Reds are committed to that and he is as well then its all good.If the direction changes in a few weeks and he comes up and plays second then well is it still good?Lets remember this team did not sign Scooter and could still but what if he comes back in June and doesn’t do so well or what if he hits the market next year regardless.Lots of what if’s I know but we have Siri and Trammel as upcoming outfielders along with what is here now and if Puig gets signed then we have a bunch of outfielders.I feel the Reds owe it to themselves and Senzel to make a decision as to where he is going to play and move on.He ain’t getting any younger and he ain’t played one inning in the big leagues. No game thread. Roark got abused by Braves hitters, 1.2 IP and 5 runs. Stephenson with an odd stat line 2.0 IP, 1 H, 1 BB, 2 R, but no home run given up. Winker with a good night so far at the plate, 2-3, 2B, 1 R, 2 RBI. The most underreported story of spring training is Raisel Iglesias’ lost velocity. I have some concerns too. I hope it is just a phase he is going through. I hadn’t heard about that. Do you know the amount it is down ? 92 in todays baseball is 85 back in the Big Red Machine days. First, I am confident that Senzel is the best 2nd baseman in the Reds organization now that Gennett is hurt. Regardless of whether his long term future is in center or the infield, he should step in for Gennett until / unless Scooter comes back healthy. Fine if they wait two weeks for service time but after that there is no better option. He’s been identified as an excellent fielding infielder in the minors. He will be very good at second. Second, I’m tired of the arguments that Senzel has not accomplished anything in the majors so he’ll have to wait until… what? There are no major leaguers left in the Reds organization and they promote 25 rookies? By that logic, reductio ad absurdum, Senzel should never play for the Reds until he’s played for the Reds. Joseph Heller indeed. It’s a silly argument. Luckily, you didn’t sign him to that extension yesterday. No way he should get a contract until he performs well for 2 consecutive years. You’re right – he sprained his ankle, so he’s a bust. Yeesh. Sprained his ankle, had Surgery, 2 cases of vertigo. The injury prone label is starting to apply. It certainly would be a factor in an extension. Since we have no basis to see how he is going to do at the MLB level, that would factor in as well. Noone is saying dump him right now, but its not worth to either side hammering out an extension. And listening to the broadcast – in the 9th inning they said Senzel left the minor league game with an ankle injury … no indication as to severity. And like clockwork Nick Senzel is injured again. Reds are after the fact vindicated for sending him down, as i think we are all in agreeance that the first day that Nick draws service time should not be spent on the DL. This also busts the Bryant Harper comparasons as neither individual spent nearly as much time on the DL as NS. Additionally, while a healthy NS may have been called up last year, he was not, and there is not a problem with making sure he can maintain his health. No extension this year. You definitely a piece of work matt,did nick senzel do something to you? (Retweeted by C.Trent Rosecrans) Ken Rosenthal tweeted: “per source, X-ray negative. MRI tomorrow.” Here’s hoping for additional positive news, and that this turns out to be relatively minor. Just guessing based on the fact they are doing a MRI that it is a Moderate Grade 2 to Severe Grade 3 ankle sprain. I’m no doctor, but I did spend some time at a Holiday Inn Express a few months ago. Sounds like Scooter and Nick could both be ready about the same time. I have a feeling Jose Peraza is going to have a monster first couple of months at second base, both defensively and offensively. this will force the reds to make some decisions about Senzel and (scooter). I Feel his best chance to make the reds team as an everyday player is to learn the shortstop position. the other option which is unpopular but in my humble opinion the most likely eventual outcome is moving Suarez over to first. this frees up space for both India and Senzel to be in the lineup. obviously this moves Joey to the bench but you will have by far the strongest bench in the NL (especially if you can also sign scooter to a long term contract as a key bench player) and a young athletic infield. Absolutely zero chance of that happening. Votto isn’t going anywhere unless the NL moves to a DH, and that may open a slight possibility of a move. Moving a HOF to the bench to make room for a prospect simply will not happen. To me this isn’t a true service time manipulation like Bryant’s although Senzel may feel that way. Did he do enough to be the clear CF starter? No. Has he proven to be a durable everyday guy? No. Does he have anywhere else to play besides bench? No. With Scooter going down I thought there might be a chance to make the argument for service time manipulation but could also see the need to have him say in AAA to get reps at 2nd since he’s been working on CF. Now he’s hurt, again. I’m excited as everyone else for Senzel to make his debut and be a great player but I’m am not for any extension until he can prove his durability more than his ability. This team can’t afford to extend/pay extra for someone that is always hurt. Matt Wisler to get re-assigned or placed on outright waivers. Stephenson and Peralta make the final 2 bullpen spots. Now that Senzel is out this is all a moot point for now. Don’t be surprised if a year from now Senzel is still our #1 prospect and set to play 2B or 1B with Votto moving to DH. Dallas Keuchel is still a free agent…literally everybody passed on him to this point.